The British Rail Class 158 Express Sprinter is a diesel multiple-unit (or DMU), built specifically for British Rail between 1989 and 1992 by BREL at its Derby Works. They were built to replace many locomotive-hauled passenger trains, and allowed cascading of existing Sprinter units to replace elderly 'heritage' DMUs. The Class 159 DMUs are almost identical to the Class 158s, having been converted from Class 158 to Class 159 in two batches. A total of 182 units were built. The majority were built as two-car sets. 17 units were built as three-car units; eight of these units have since had the centre car removed, whilst another eight have been upgraded to be Class 159s. The final ten units were built specifically for West Yorkshire PTE Metro services around Leeds. There were three varieties of unit when built. The standard batch, two- and three-car units (158701—158814 and 158901—158910) had 350 hp (260 kW) Cummins engines. The next batch (158815—158862) were built as non-standard to enable 350 hp (260 kW) Perkins engines to be fitted. The final batch (158863—158872) were given higher-powered Cummins engines of 400 hp (300 kW), as it was originally intended that these units would work the steeply graded Welsh Marches Line. Another 22 of these higher-powered units were built, and became three-car Class 159s. Over time, the units have become mixed up as franchises changed, and higher- and lower-powered units can be seen working on the same routes. All units use P4-4A and T4-4A bogies. All units have BSI couplers which enable them to work in multiple with Class 150, Class 153, Class 155, Class 156, Class 159 and Class 170 units, as well as units of the same class. However, they cannot work in multiple with Class 165 or Class 166 units due to incompatible wiring arrangements. When introduced, British Rail described the Class 158s as bringing "new standards of comfort and quality to rail travel on Regional Railways' key long-distance cross-country routes". As built, interiors were described as fully carpeted, with "panoramic" windows and a variety of seats arranged both airline-style and in bays of four around tables. Unlike previous members of the Sprinter family, such as the Class 156 SuperSprinter, the Class 158s featured air conditioning, an on-board payphone, power-operated interior doors, a toilet in each carriage, and provision for a refreshment trolley service. Despite an increased top speed of 90 miles per hour (140 km/h), the units also promised a smoother, quieter ride than its predecessors. The Class 158s were expected to achieve 13,500 miles of operation between major services and a range of up to 1,600 miles from each refuelling. Despite the attention given to passenger facilities, the phrase "garden shed engineering" has been used to describe the build and technology of the Class 158s. As a lightweight unit and the first members of the Sprinter family to use disc brakes, autumn leaf mulch built up on wheel rims and prevented the units from correctly operating signalling track circuits. Though later solved by installing scrubbing blocks to clean the wheels, temporary solutions were sought in October 1992, with some units split and formed into hybrid units with Class 156 coaches, as the latter had tread brakes which cleaned the wheels as a by-product of their operation. The class has also suffered from unreliable air-conditioning systems since the outlawing of the CFC gases with which they were originally designed to work. Following privatisation, many operators undertook to re-engineer or entirely replace such equipment. As a result, the systems in use and their effectiveness now vary across the fleet. The lightweight aluminium body of the Class 158s leads to a good 'route availability' score, meaning that it is able to operate in parts of Britain where heavier units cannot. However, the units were once blocked from operating between Manchester and Buxton due to the possibility of the large roof-mounted air vents striking low bridges and have also been refused permission by Network Rail to operate on the Conwy Valley and Borderlands lines due to station dwell times and issues of platform clearance. ScotRail was the first part of British Rail to introduce the Class 158s to service, gaining a fleet of 46 units which entered squadron service in 1989. These were employed on Glasgow Queen Street to Edinburgh Waverley services, as well as services to Aberdeen and Inverness. The Class 158s then went on to be deployed elsewhere in Britain, primarily in the Midlands, Northern England, Wales and the South West. With the majority of the fleet coming under the control of the Regional Railways division, the Class 158s became a mainstay of secondary express services between provincial towns and cities. 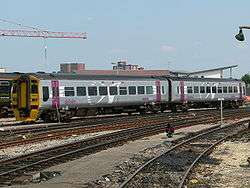 Examples included long-distance Trans-Pennine services in the north of England, as well as a range of upgraded regional services under the Alphaline brand in the Midlands, Wales and the South West. A small batch of units numbered 158747-158751 were used by InterCity to supplement its core fleet on some cross-country services, mainly from the North West to Scotland, but also to Portsmouth. Units regularly appeared on off-peak workings between Birmingham and Manchester, and also on Sunday mornings between Birmingham and Doncaster. After the privatisation of British Rail, the Class 158 fleet was divided among several franchises. There is an ongoing fleet shuffle with many units being swapped between operators. The first privatised incarnation of ScotRail inherited a 46-strong fleet which continued in service. Following the introduction of newly built Class 170 Turbostar units on primary express services in 1999, the Class 158 fleet was reduced in number by six, with those remaining cascaded away to secondary routes such as the Far North Line. This in turn allowed older units in the company's fleet to be withdrawn. However, Abellio ScotRail and Northern operate the largest fleets of Class 158 units. In 2003, plans existed for part of the fleet to be swapped with Class 156 units operated by Central Trains, as the latter were thought better suited to some of the short-distance routes now being operated by ScotRail's 158s. However, this failed to materialise and by the mid-2000s operations of the ScotRail 158s ranged from short hops (such as Glasgow Queen Street to Anniesland) to rural lines and long-distance expresses, supplementing other express units. In 2010 these units started to appear at Glasgow Central station to run on the Glasgow Central to Edinburgh via Shotts line, and on to the Glasgow Central to Whifflet line. Some additional units have since been acquired from other operators to provide extra capacity. Refurbishment and reliverying has also taken place since privatisation. The original ScotRail franchise applied its own livery to the Class 158s, followed by a further repaint by First ScotRail after it took control of the franchise. The fleet has now gained a permanent blue-and-white livery based on the Scottish Saltire, after Transport Scotland announced in September 2008 that it was specifying a permanent livery for all Scottish trains, which will not be changed in the event of a change of franchisee. Interiors have also seen attention on more than one occasion. The most recent refurbishment of 25 units involved repainting, new seating, extra luggage space and new customer information systems. Toilet retention tanks were also fitted. Several of the ScotRail units have had names attached - for example 158702 is named "BBC Scotland - 75 Years", 158707 is named "Far North Line - 125th Anniversary", 158715 is named "Haymarket" and 158720 is named "Inverness and Nairn Railway - 150 Years". Arriva Trains Wales (ATW) 158823 at Barmouth. Class 158s are required on Cambrian Line services as they are the only ATW trains fitted with the ERTMS signalling used on the line. In the early days of privatisation, the Class 158 Express Sprinter units were in regular use by Wales & West on its long-distance Alphaline services from South Wales to North-West England, North Wales, Cornwall and London Waterloo, as well as on some Central Trains services to Cardiff Central and along the Cambrian Line. Successor companies Wales & Borders (2001) and Arriva Trains Wales (2003) continued to use this type of unit on similar workings, with a total allocation of 40 units also allowing Cambrian Line services to become entirely Class 158-operated. By the end of 2006, a total of 16 units (158815-158817 and 158842-158854) had returned to the leasing company as Arriva gained exclusive use of the entire Class 175 Coradia fleet which had previously been shared with other train operators. The remaining 24-strong Class 158 Express Sprinter fleet became permanently based at a purpose-built depot in Machynlleth during 2007. Despite initial problems in retro-fitting the necessary 'glass cockpit'-style driver controls, Arriva's Class 158 Express Sprinter units became the first fleet in the UK to be equipped for regular use with the ETCS Level 2 signalling system. Commercial operation under ETCS started on March 28th, 2011. Accordingly, the units operate all Cambrian Line services between Mid Wales and Birmingham, as well as supplementing the Class 175 Coradia units on other long-distance routes. In 2009, Arriva also proposed using the fleet to provide a direct service between Aberystwyth and London, although this proposal was later rejected by the Office of Rail Regulation. A complete refurbishment programme to provide the Class 158s with full 'as new' interiors took place between December 2010 and October 2012. Funded by the Welsh Assembly Government at a cost of £7.5m, work completed includes interior and exterior repainting, along with replacement of seating, wall coverings, carpets, lighting, luggage racks and toilet fittings. A passenger information system has been fitted, while selected seats have gained at-seat power sockets for mobile phones and laptops. Until this refurbishment, the fleet had seen only minor attention to its interior since a refit by Wales & West in the late 1990s, as well as having been only partially repainted into Arriva colours externally. The Class 158 Express Sprinter Units were introduced to the East Midlands by Regional Railways Central to replace the Class 156 SuperSprinter on long-distance express services branded as Alphaline, such as Norwich to Liverpool Lime Street via Nottingham. Following privatisation, Central Trains operated these services but quickly procured a large fleet of Class 170 Turbostar units for such services and transferred the Class 158 fleet to secondary routes such as Birmingham New Street to Hereford and Derby to Matlock. East Midlands Trains (EMT) has a fleet of 25 units inherited from Central Trains, with some units transferred from First Great Western and South West Trains. EMT's Class 158 Express Sprinter units operate long-distance express services (such as Norwich to Liverpool) and secondary non-express workings such as Nottingham to Skegness, Nottingham to Matlock and Leicester to Lincoln Central. The hourly Norwich to Liverpool service has been criticised for overcrowding, especially between Liverpool and Nottingham. This resulted from the Department for Transport specifying two-coach units in the EMT franchise starting in November 2007. In the light of persistent and excessive overcrowding, with some passengers being left behind on occasions, the DfT eventually admitted that it had made a mistake. Various cascades of other units enabled more Class 158 stock to be released for this route, and from the December 2011 timetable change the busiest services have been lengthened to four-coach trains between Liverpool and Nottingham, with units splitting and joining at Nottingham as necessary, two-coach trains being regarded as adequate between Nottingham and Norwich. Further services on this route were strengthened from December 2012. In May 2015 158889 transferred to EMT from South West Trains on a 2-year loan. It retains its SWT interior but has been re-branded with EMT logos. The Wales & West franchise (later Wessex Trains) originally operated twelve Class 158 Express Sprinter units on long-distance services on the Wessex Main Line. These units were extended into three-coach formations with the acquisition of further units. Unlike the purpose-built three-car Class 158s and Class 159 units, the centre car was a Driving Motor with the cab locked out of use and an adapter to connect the different-sized gangways. In 2006, First Great Western (FGW) inherited the Wessex Trains fleet following the merger of the Great Western and Wessex franchises. FGW then swapped most of their former Wessex Trains Class 158s for former First TransPennine Express examples. This was so that FGW could have all Class 158 units that were owned by Porterbrook. During late 2007 and early 2008, the FGW Class 158 Express Sprinter fleet was refurbished. Improvements included: re-upholstery of seats, and repainting or replacement of interior fittings, alterations to interior lighting and total replacement of toilets. Additionally the windows have been replaced with safer laminated glass and Halon fire extinguishers replaced with foam ones. At the same time the units' engines were overhauled and the units repainted in FGW's own lilac and blue colours. The fleet is now used on the long-distance Cardiff Central to Portsmouth Harbour/Brighton, and Weymouth to Worcester Shrub Hill/Great Malvern services. Great Western Railway operates a total of 15 units, of which 12 are hybrids (units where the centre coach is a driving coach from another unit of the same class), one is a purpose-built 3 car unit and two are two coach sets. Following privatisation Northern Spirit (later renamed Arriva Trains Northern, and subsequently Northern Rail in 2004) was created from Regional Railways North East. Northern Spirit inherited a large fleet of Class 158 units, many of which were used on TransPennine Express services, the rest on West Yorkshire Metro-sponsored services. First North Western (descended from Regional Railways North West) had eight Class 158s, which were based at Newton Heath and used on various mid- to long-distance routes, which were transferred to Leeds Neville Hill depot at the start of the Northern rail franchise and are now exclusively used on former Arriva Trains Northern routes. A number of 158s are currently sponsored by Merseytravel despite the fact that they do not go near Merseyside. This sponsorship is to ensure that Class 156s were cascaded from West Yorkshire to the busiest Merseyside services. In late 2004, TransPennine Express obtained further units from Central Trains, allowing the formation of six 3-car units, 158971-976. 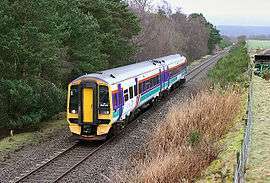 In 2006 First TransPennine Express started to replace its Class 158s with newer Class 185 Pennine and Class 170 Turbostar units. The Class 158s were subsequently transferred to Northern Rail, Central Trains, South West Trains and First Great Western. Northern Rail has recently completed a refurbishment programme on the three-car Class 158 DMUs and is continuing to refurbish its fleet of two-car Class 158 DMUs. It and Abellio ScotRail operate the largest fleet of Class 158 units. Class 158752 was the first unit of the Northern's fleet to get the new livery which was completed in October 2016. Currently South West Trains operates Class 158s from Salisbury to Waterloo and on the Salisbury to Romsey via Southampton Central service, between Brockenhurst and Lymington on weekdays, and on a variety of local journeys within Hampshire. Should South West Trains receive a three-car train, it will be converted into a Class 159 unit, possibly to avoid confusion. One unit is on a daily loan contract to Great Western Railway, whilst South West Trains Class 158s have also been hired out to sister Stagecoach company, East Midlands Trains, and two are on loan to Abellio ScotRail. South West Trains operates Class 158s 158880-890. 158885 differs from the rest of the units by having one driving car fitted with a ZF fuel saving transmission instead of the usual Voith T211rz or T211rzz hydraulic. Originally brought in to replace South West Trains class 170 fleet, SWT's class 158s saw a brief use on the former Reading to Brighton service, before the service was truncated at both ends within the new South Western franchise of 2007. Prior to the introduction of the Class 220/221 Virgin Voyagers, Virgin CrossCountry operated a small number of Class 158s, numbers 158747-158751. These were used on Manchester Piccadilly/Liverpool Lime Street to Glasgow/Edinburgh services via the West Coast Main Line. One also did the Swindon-Stroud-Birmingham route. Most of these units are now operated by Great Western Railway. 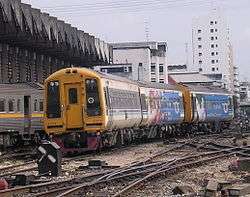 In 1990-91, BREL built twelve 3-car units based on the Class 158 for State Railway of Thailand. These differ from the British units in being fitted to Thailand's metre gauge, featuring differently styled outer-end gangways, manually operated inward-opening hinged doors (as opposed to the British plug doors), reversible seating and additional air-conditioning. They originally retained the original white, blue and black 'Regional Railways Express' livery. All units of Class 158 of State Railway of Thailand were refurbished in 2011. The refurbishment involved the repainting of the trains into a new livery and the lengthening of the trains to 4 coaches. 1 2 3 4 5 6 7 8 9 10 11 12 13 14 "Data Sheets - Regional Passenger Trains: 158 - BREL Express Sprinter". Angel Trains. Retrieved 19 September 2014. ↑ "THE NORTHERN INTERIM FRANCHISE AGREEMENT" (PDF). Retrieved 22 April 2015. ↑ "Our Fleet". Arriva Trains Wales. Retrieved 2 March 2014. 1 2 "First Great Western: Regional Train Fleet". Archived from the original on 20 October 2011. Retrieved 29 April 2010. 1 2 3 4 "Our Trains". South West Trains. 2010. Retrieved 18 September 2010. 1 2 Network Rail (15 February 2010). "ERTMS gets tested in Wales". Retrieved 16 September 2010. ↑ "Mechanical And Electrical Coupling Index". Rail Safety and Standards Board. Archived from the original on 21 December 2013. Retrieved 20 December 2010. ↑ "Class 159" (PDF). Porterbrook. 1 2 3 4 British Rail Central Advertising Services: "Your New Train is Here", January 1991. 1 2 Dalton, Alastair (29 July 2002). "ScotRail launches £2.2m bid to improve unreliable trains". The Scotsman. Edinburgh. Retrieved 28 May 2010. ↑ "Misformed Sets - 156 Super-Sprinter - Trans-Pennine Hybrids". Metro-Cammell Class 156 Super-Sprinter. Retrieved 15 June 2008. ↑ "Environmental Report 2001" (PDF). National Express Group. Retrieved 28 May 2010. ↑ Johnston, Howard, ed. (2001). "The comprehensive guide to Britain's Railways, 4th ed.". Peterborough: EMAP Active. ISSN 1368-437X. ↑ "Rejection of proposed Vehicle Change: Class 158 Blaenau Ffestiniog Branch" (PDF). Network Rail. 22 December 2005. Retrieved 25 February 2009. ↑ "Rejection of proposed Vehicle Change: Class 158 Wrexham Central to Bidston" (PDF). Network Rail. 22 December 2005. Retrieved 25 February 2009. ↑ "2nd Generation Multiple Units". www.meaker.me.uk. Retrieved 28 June 2010. ↑ Picture of the Day 11 March 2008, therailwaycentre.com. ↑ Class 158 Relivery Details, scot-rail.co.uk (Enthusiast website). ↑ "Scotland's Railway" Archived 6 April 2012 at the Wayback Machine., Transport Scotland. ↑ "Railcare Springburn Class 158 Scotrail Internal refurbishment". Concept Applications. Retrieved 28 June 2010. ↑ "Renovation: Class 158 Express (DMU)" (PDF). RailCare. Retrieved 28 June 2010. ↑ "Delivery against our priorities: Improved connections". Transport Scotland. 17 December 2009. ↑ Wales and Borders trains in 2002, railfaneurope.net picture gallery. ↑ Newsletter No. 20, Shrewsbury to Aberystwyth Rail Passengers' Association, 2001. 1 2 Fleet lists: Class 158 Archived 5 February 2012 at the Wayback Machine., thejunction.org.uk. ↑ "Pioneering past powers Arriva's future". RailNews. Stevenage. 17 September 2007. ↑ "Sun glare delays new train system". BBC News Online. 17 May 2010. Retrieved 18 September 2010. ↑ Hulme, Charlie (24 May 2010). "North Wales Coast Railway Notice Board 24 May 2010". Retrieved 17 September 2010. ↑ "Proposal for new direct Aberystwyth to London service submitted to the Office of Rail Regulation" (Press release). Arriva Trains Wales. 4 September 2009. ↑ "Aberystwyth to London direct rail route rejected". BBC News Online. London. 1 March 2010. 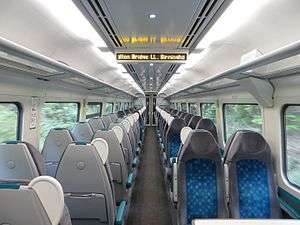 ↑ "Refurbishment of Arriva Trains Wales fleet announced" (Press release). Welsh Assembly Government. 2 August 2010. ↑ Crump, Eryl (2 August 2010). "Taxpayers to pay for £7.5m trains upgrade". Daily Post. Liverpool. ↑ "£7.5m upgrade for Arriva Trains Wales". Transport Business International. 2010. Archived from the original on 24 July 2011. 1 2 3 Miles, Tony (April 2012). "Nottingham-Liverpool capacity boost: Four-cars on key inter-urban route". Modern Railways. Stamford. pp. 56–58. ↑ Clinnick, Richard (4 November 2009). "Class 158s set to relieve overcrowding for EMT". Rail. 630. Peterborough. p. 28. ↑ "Great Western regional refurbishment underway". Railway Gazette International. London. 12 December 2007. 1 2 Grantham, Andrew. "Export Class 158 in Thailand". Wikimedia Commons has media related to British Rail Class 158. Knight, Steve (19 October – 1 November 1989). "Class 158 preview". RAIL. No. 107. EMAP National Publications. p. 9. ISSN 0953-4563. OCLC 49953699.